This year’s Larry Evans Memorial in Reno is chock-full of illustrious names. Seven grandmasters made the trip: Melikset Khachiyan, Alexander Ivanov, Sergey Kudrin, Jim Tarjan, Enrico Sevillano, Nick DeFirmian, and Walter Browne. What decade is this, anyway?! With DeFirmian, Tarjan, and Browne, you’d think it was the 1970s. It’s so great to see them playing again, and knocking heads with upcoming young players like Colin Chow and Andrew Zhang Hong (the #1 10-year-old in the U.S.). Going into round four, there were three players with 3/3 (Ivanov, John Bryant and Andrew Karklins). All of the games on the top four boards were still going on when I last saw them, so I’m afraid I will have to leave you in suspense as to how they came out. My tournament has been okay so far. In round one I played Pranav Senthilkumar (the #37 12-year-old). The opening was strongly affected by my recent series of posts on top openings. I was White, and I played the Catalan for the first time in my chess career. Why? Because Chessbase says that White does better when he meets 1. d4 Nf6 2. c4 e6 with 3. g3. So I said okay, let’s try it. It eventually got down to a rook and pawn endgame where I had an extra pawn but it was doubled (two pawns on f3 and f4 blockaded by Black’s pawn at f5). Nevertheless, I was able to win a nice endgame, mostly because my rook was much more active than his. In round two I played a poor game against Alexander Kretchetov. I played a variation of the King’s Gambit Declined that I used to know very well, but I messed up the move order, eventually improvised a pawn sac that gave me a little compensation but not enough, and then I missed a tactic that lost a piece. Ugh. Memo: Improvising against 2400 players — not a good thing to do. In round three I played Black against Ruth Haring. She got a lot of pressure against me in the middlegame, but I withstood it and then probably stood a little bit better in the endgame. However, it looked to me as if the advantage was purely symbolic — no real winning chances — so I accepted her draw offer. I think that when I put it on a computer the computer will say that neither side ever had more than a 0.5-pawn advantage. Finally, in round four I played against Chinguun Bayaraa, who is the #5 9-year-old in the country. That’s right, nine years old and he’s almost an expert. Fortunately, I took advantage of the chance to beat him while I still can. He was totally bewildered by the opening I played as Black (1. d4 Nf6 2. c4 d5) and I got a slight advantage. Just when it looked as if he was equalizing, he missed a little three-move combination that won a piece. Sort of made up for my missing a tactic against Kretchetov. So, going into the last day, my score is 2½-1½. Definitely in contention for a prize, definitely in contention to raise my rating — but it will all depend on how I do tomorrow. P.S. Here’s an indication of how strong this tournament is. Jason Cigan, an expert, was paired against GM Walter Browne in the first round and managed to draw him. (He said it was the most complicated game he ever played.) What was his reward? A game against GM Melikset Khachiyan, the highest-rated player in the tournament, in round two! He was not able to repeat his first-round magic. That’s pretty harsh for an expert, having to play two grandmasters in the first two rounds! P.P.S. There are three women in the open section, so of course two of them were paired against each other in round two. Uyanga Byambaa pulled off the upset over WGM Anjelina Belakovskaia. Congratulations, Uyanga! I definitely want to see that game. UPDATE — 11:20 PM. Alexander Ivanov beat Andrew Karklins on board one to move into sole possession of first place at 4-0. 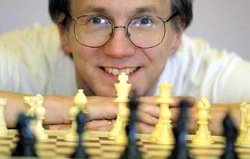 The other player who went into the round with a perfect score, John Bryant, drew against Sergei Kudrin fairly quickly and is now tied for second at 3½-½. The finish of the Karklins-Ivanov game was quite nice, and perhaps I will show it to you in a later update, but for now I’d better get some sleep! Reminds me of a tournament several years ago where I got paired against FM’s in rounds one and two. After losing to the first FM, I consoled myself with the thought that at least I should be paired down in the second round. Unfortunately, another FM had been upset in the round one, which is why I was the poor lamb to the slaughter and had to face him in round two. Needless to say, I lose that one as well.